Like so much else in modern homebuilding, Custom Homes & Development EFG Company (EFG) leads the way in comprehensive Warranty Coverage and Customer Care. Your home will be protected by our comprehensive, transferable warranty coverage, giving you the comfort of knowing that one of the largest, most dependable homebuilding firms in the nation stands behind you. The Contractor signatory below Custom Homes & Development EFG Company (‘Contractor’) hereby guarantees _______________________ (‘Owner’) that the construction executed on or upon the structure location at ___________________________________________ to be free from defects in material and workmanship for a period of one year from the date of commencement of use, substantial completion or date of notice of completion. Whichever is first to occur. 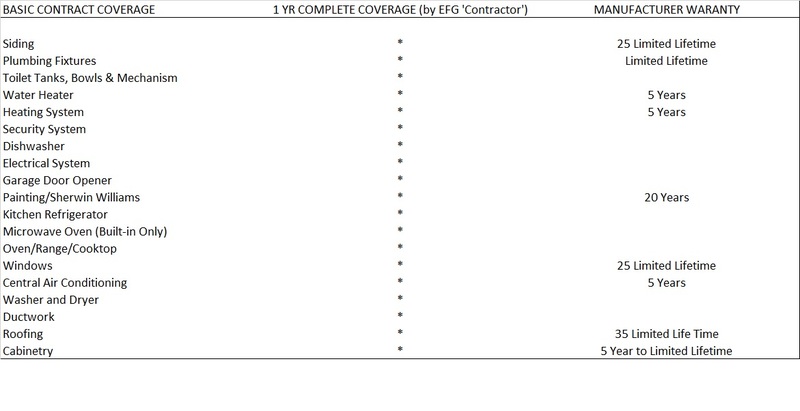 EFG ‘Contractor’ will provide a one year complete coverage warranty. When the one year commences the Manufacturer may offer an extended warranty. At that point in time, EFG ‘Contractor’ is no longer responsible for any Manufacturers warranties. All issues and/or questions should be directed to the specific Manufacturer. To the construction work that has not been subject to accident, misuse and abuse. To the construction work that has not been modified, altered, defaced, and/or had repairs made or attempted by others. That the contractor be immediately notified in writing within ten (10) days of first knowledge of defect by owner or his/her agents. That the contractor shall be given first opportunity to make any repairs, replacements and/or corrections to the defective construction at no cost to the owners within a reasonable period of time. Under no circumstances shall the contractor be liable by virtue of this warranty or otherwise for damage to any person or property whatsoever for any special, indirect, secondary or consequential damages of any nature however arising out of the use or inability to use because of the construction defect. EFG Property has always focused on creating maximum value in your new home by using high quality materials, innovative design standards and industry best practices. Our exacting approach begins with the framing components of your home, Stick built on site for a much better construction compared to trusses and manufacturers build. EFG is taking the concept of total quality and value to a new level, by building all of our homes with ENERGY STAR guidelines in mind. ENERGY STAR qualified homes are quieter, have lower utility bills and help protect eh environment by reducing greenhouse gas emissions. Windows are made with Low-E coated glass, which keeps out excess heat and cold to help control energy costs, and protects furniture and floors from fading. Your EFG Home uses an air conditioning system that conserves energy to keep cooling costs low, and is backed by the best warranty on the market. The ENERGY STAR qualified appliances in your EFG Custom Home incorporate advanced technologies that use 10-50% less water and energy than standard appliances. EFG Homes are built with insulated exterior doors, so your home won’t lose excess interior heating and cooling at these entry points. EFG Custom Homes’ insulation is part of our whole house approach to energy efficiency, helping to maintain the temperature in your home. We size air ducts specifically to each home, then seal them to increase heating and cooling efficiency. Silicone sealants used in EFG keep excess heat and cold out of your home, and protect against outside moisture. The airflow vent system in your roof’s ridgeline helps cool your home in the summer by releasing excess heat, thus reducing cooling costs. Insulated basements keep out excess moisture and stay warmer in the winter. Programmable thermostats can be programmed to save you money in heating and cooling costs annually. Our house wrap protects your walls from air and moisture infiltration. Your kitchen features cabinetry, a manufacturer that has received special certification for environmental stewardship. Our interior and exterior paints are low in VOCs (Volatile Organic Compounds), meeting LEED (Leadership in Energy and Environmental Design) criteria. Your home is landscaped with native plants and materials for your area, reducing the need for extra irrigation. Our exterior vinyl siding contains recyclable material. These are just some of the examples of EFG Custom Homes’ commitment to helping you use less and save more. Pre-Settlement Demonstration: Every EFG Custom Home and Remodel (EFG) homeowner, prior to taking possession of his or her new home, meets with a EFG representative who has been involved with the construction of his or her home. At that meeting, the operation of all equipment and the maintenance responsibilities of the homeowner are reviewed. Together the EFG representatives and the homeowner conduct a demonstration of the home. Any items that are not up to industry standards of workmanship will be listed for correction. Items listed should be corrected by EFG within ten (10) days, weather permitting. 11 Month Final Review: Ten months after the closing date, another review is scheduled with the homeowner to identify and list any issues which might have developed during the early months of occupancy. When the items listed during this review are repaired, the homeowner signs the form noting that the repairs have been completed. If you maintain your home carefully, it should remain in excellent condition for many years. Emergency Situations: If a situation exists that make the home uninhabitable, could cause lasting damage or represents a safety hazard, repairs will be made by EFG IMMEDIATELY during the warranty period. EFG’s Limited Warranty: The following is a description of EFG Homeowner Limited Warranty. It does not constitute the actual warranty. For the actual warranty in its entirety, please refer to the EFG Homeowner’s Manual. To the extent that additional warranty obligations are required by applicable federal, state, or local law, such obligations supersede the terms of EFG’s Homeowner Limited Warranty. One Year Limited Warranty on the Basic Home: EFG warrants that the home and driveway, walkways, steps, patios, porches and decks (if any) supplied by EFG with the Home under the same purchase agreement will be free from defect in materials and workmanship of the original construction for a period of one (1) year from the Warranty Date. Current List of Continued Manufacturers Covered Warranties: (Each Custom home may vary, please ask your project manager for updated list of your home) Our concern with quality construction doesn’t stop at the point of sale. We carefully select the people who build your home. Our sub contractors are responsible, high quality professionals, who direct and inspect each phase of the home’s construction. To give you peace of mind, we make a least two service reviews with our homeowners, one prior to settlement and another 11 months after settlement. There is no additional cost to the homeowner for this level of service. We promise to be there for our customers, both before and after they purchase. Our service program is proactive, sincere and convenient. It’s part of our overall concern for our customers and helps to explain why more than half our business is generated through referrals.